Nestled in the mountains, Wilmington is a working, vintage village that has evolved from its mill town roots to an engaging and entertaining town center. At the only stoplight on Route 9 between Brattleboro and Bennington, Wilmington is the nearest Vermont skiing destination for major East Coast cities. Mount Snow, and Timber Creek provide both alpine and cross-country skiing. Walk or hike miles of woodland trails, and paddle with the Zoar Adventure Center on one of the many lakes where fishing and boating abound. Summer celebrates the best of farm-to-table culture: fiddleheads, blueberries, wine & harvest, and Farmer’s Day Festivals. The walk-able downtown leads to a dozen eateries: from breakfast at Dot’s Diner on the way to Lake Harriman, or a quick bite or drink après-ski at Jezebel's. If you'd like to take more time, there's also multi-course dining at The Anchor, Folly, Cask & Kiln and Mangia e Beve. The acoustically wonderful Memorial Hall hosts performances from puppet shows to folk, rock and jazz, along with community events including lectures, readings and crafts. Check out the Southern Vermont Natural History Museum on Hogback Mountain or the local historical society, and venture into the McGrath or Wright Galleries to see painters at their craft. Local boutiques round out a selection of gifts, homewares and clothing including specialty stores such as Quaigh Designs, The Vermont Bowl Company and the Norton Quilt House. Bartleby’s bookshelves are stacked with the latest for a rainy-day read – and feature a great selection of children’s books. Make Wilmington your home base to explore the natural wonder of Southern Vermont—it's just a tank away. 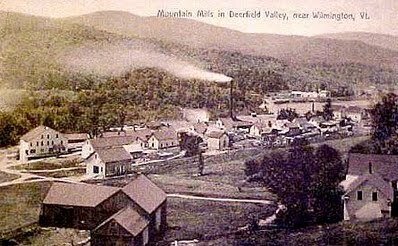 Wilmington is nestled in the Deerfield Valley of the Green Mountains of southern Vermont, with the North Branch of the Deerfield River winding gently through the downtown. The picturesque village is surrounded by beautiful mountains and bucolic countryside, minutes from the shores of the Harriman Reservoir. All four seasons are special here and many who come to visit end up staying for the natural beauty and rural way of life. The town was chartered in 1751 by Benning Wentworth, the governor of the colony of New Hampshire. The name Wilmington was chosen to honor Spencer Compton, the first Earl of Wilmington. In addition to shopping, fine dining, the famous Wilmington VT flea market and more, the town is surrounded by nature and opportunities to explore Vermont’s Green Mountains. From hiking in Molly Stark State Park, fishing in Lake Whitingham or skiing the slopes of Mount Snow, Wilmington offers endless outdoor activities in every season. So if you love to swim, kayak, fish, golf, bike, hike, ski, or snowmobile - now is the time to schedule your Vermont vacation! Visitors will find the town easily - at the junctions of Routes 9 and 100 - a short 2.5 hour drive from Boston or 3.5 hours from New York. With a population of about 2000 residents, Wilmington is home to a diversity of residents - from recent transplants from New York and New England to second homeowners to families who have called the Valley home for generations. The size of Harriman Reservoir is impressive, but its history is what grabs your attention. Along the reservoir’s floor are remnants of an old logging village that was flooded in the 1920s when the Deerfield River was dammed to generate power. 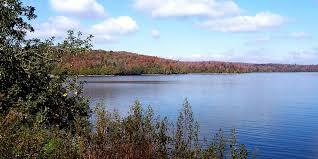 Harriman Reservoir, also known as Lake Whitingham, is the largest body of water located entirely within the state of Vermont. Enjoyed by boaters, swimmers, paddlers, and fishermen, the reservoir extends about 10 miles from Wilmington to Whitingham in southern Vermont. The scenic reservoir is owned by TransCanada and is a source of hydroelectricity. Originally developed by the New England Power Company in 1922-23, the reservoir flooded the former pulpwood and lumber village of Mountain Mills, located just outside of Wilmington. When water levels are low, you can occasionally spot submerged tree stumps and foundations from Mountain Mills. How extraordinary would it be to come across this forgotten little village?